Skate veteran and educator Bill Robertson, also known as "Dr. Skateboard," teaches students who might have otherwise fallen through the cracks about speed, velocity, and momentum at the local skate park. I've been an educator for over 20 years, a journey that's taken me from being a middle and high school teacher to an Associate Professor of Science Education. I've also been a skateboarder for over 37 years. I started riding my board when I was a seventh grader in my hometown of Richmond, Virginia and stayed with it because it was fun and something I could do with my friends. Skateboarding quickly became my passion. It's still part of my everyday life and continues to influence the way in which I see the world. "Dr. Skateboard" was a nickname I earned as a skateboarding educator. I've made it my mission to inspire students toward pursuing goals in education along with their own personal interests. My inspiration for choosing skateboarding to teach physics came from my work with middle school students who were not interested in the topics of science class until I showed how much of physics, such as forces and motion, were found in things they did regularly -- like skateboarding. 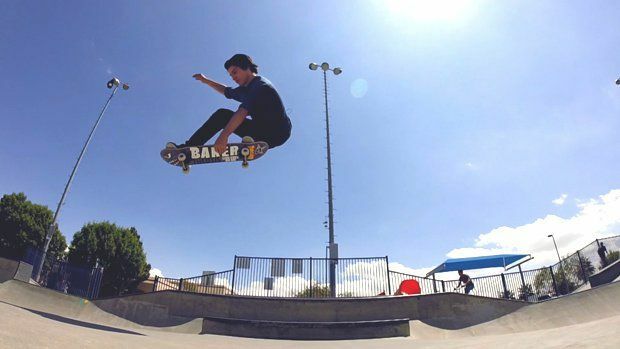 A skateboarder catches some air in a skate park. Often, students will ask their teacher, "What is the point of this?" or "Why are we doing this anyway?" They want to know exactly how the material they're learning in class will apply to their everyday lives because, at times, it seems disconnected from what they do. Physical science concepts are often taught quite traditionally in school, and in an almost clinical manner, isolated to a specific circumstance within a classroom. This is what disconnects the tools and the content from the students' experiences. There is a real need for educators to explore and connect content in settings that are both authentic and relatable for students. This is what I set out to do through "action science," which makes science real to students and makes learning relatable. For me, skateboarding is a great way to do that. For example, in skateboarding, one trick you need to master is the Ollie. The Ollie, a skater's technique for flying through the air, showcases the principles of flight by demonstrating that you have to overcome gravity with lift, and friction (or drag) with thrust. And in this way, the physics principles of flight are the same for a skateboarder as they are for an airplane. When students understand these ideas, they're not just skateboarders. They become scientists riding around in a field laboratory, engaging in concepts in motion, forces, and simple machines. The skateboard itself has a number of simple machines that make it functional and fun. Modern decks have an upturned nose and tail. Each works as a lever for the rider, and helps a skateboarder to lessen the force exerted while performing tricks on ramps, in the street, or on the flat ground. Additionally, the trucks on a skateboard deck are fulcrums, and they allow the rider to control the movement of a trick by applying or releasing pressure on the levers. Another simple machine on the skateboard is the wheel and axle, consisting of the urethane wheels with sealed bearings and the axle that extends through the truck. On a skateboard, the wheels and axles help the rider to roll, spin, grind, and carve. By definition, the skateboard is a compound machine, as it's a device that includes more than one simple machine. As a teacher, I've seen that by first providing students with educational experiences and then introducing content, it maps better to how the modern student learns. So, under the banner of action science, and through the use of skateboarding, motivation and engagement become central ideas for both students and educators alike. So how can this be of practical use for the educator? Inherently, the teacher has to know the students in his or her classroom, recognize their interests, and understand how to integrate those interests into daily lessons. In my experience, skateboarders share the same traits as scientists in that both are trying to use a method based on experimentation to produce a result that is predictable and replicable. That is the purpose of action science -- to put concepts in physical science into the realm of youth culture, and in effect, to make science approachable, relatable, and (possibly) even cool to learn. Learning happens when you go to areas of high risk and high ambiguity. Yet it's not just enough to learn -- the goal should really center on mastery. To master something takes a long time, which skateboarders at a local park know fundamentally. My years in the field of education continually reinforce my belief that it's less about what you know and more about what you can master. When you master something, you know what it takes to be successful, and then you can apply that ability to other aspects of your life. Whether a student is mastering skateboarding, painting, the guitar, a new language, science, or mathematics, developing one kind of mastery can help him or her master something else. For teachers, we need to inspire others to use their gifts in their education, and thereby connect them to their dreams and aspirations. If this appeals directly to you as an educator, or if you use an approach like this in your teaching, I invite you to share your ideas and successes in the comments below.